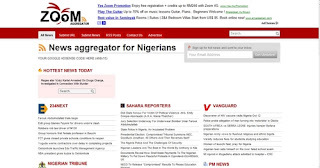 Zoomheader.com is a new online nigerian news aggregator website for Nigerians both home and abroad. It has a user-friendly interface that will make it easy for readers to find out the latest headlines from top Nigerian sites. These sites include, 234Next, Sahara Reporters, Vanguard, PM News, Linda Ikeji, Guardian, Compass, TheNET, Bellanaija, Information Nigeria, Kick Off, Celebregion, Leadership, CP-Africa, National Daily, Nollywood, Zazugist, and of course Myne Whitman Writes :), among others. The designers of the aggregator site hope this will change the way online Nigerians keep up with latest in current affairs, Politics, Entertainment news, Music, Sports, Events and Opinion because all the latest news from the listed top Nigerian websites will be streamed live on Zoomheader as soon as they're posted. Readers also have the option of baloontips to read excerpts of any news before linking to the author's page. 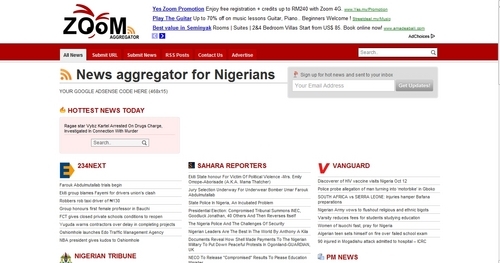 Zoomheader is billed to become an open website that will allow any Nigerian to blog on any news topic. It was designed and developed by the same person behind celebregion.com.